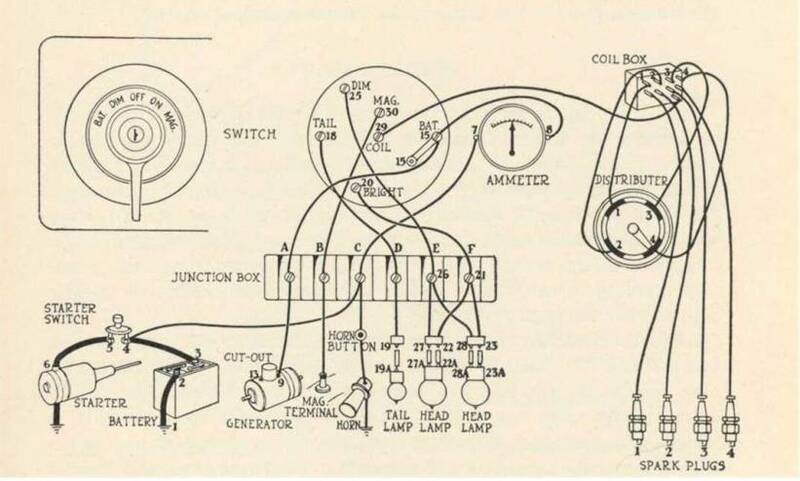 Model T Ford Forum: Sanity Check about using the coil box with a switch on the front on a later car that has the ignition switch on the dash. Sanity Check about using the coil box with a switch on the front on a later car that has the ignition switch on the dash. 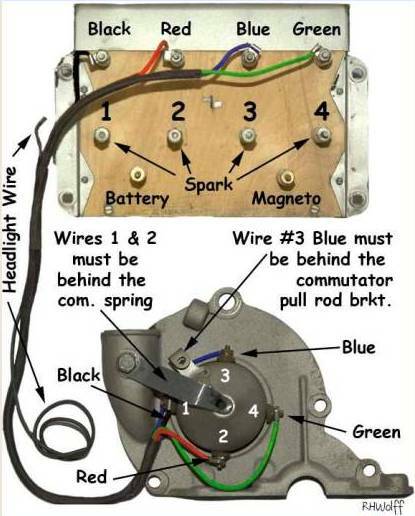 Model T Ford Forum: Forum 2014: Sanity Check about using the coil box with a switch on the front on a later car that has the ignition switch on the dash. I could have sworn I posted this last night – but when I checked this morning I didn’t see it posted. I may be getting older? I would like to know what is required to use the non-starter coil box with the switch on the front on a starter car with a dash ignition switch? I’m trying to help Dan out a little with his new chain drive Model T Truck [from his posting at: http://www.mtfca.com/discus/messages/411944/505530.html ]. I only have a few of the puzzle pieces so far, but I don’t want to cause him to “demagnetize” his magneto nor do I want to send him down a rabbit trail. 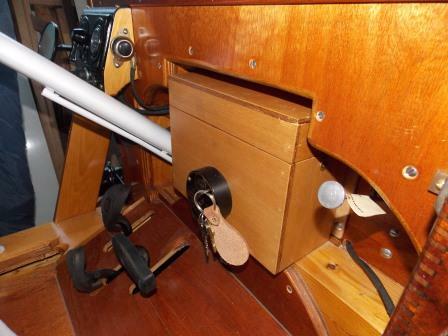 He has an earlier coil box with the switch on the front of the coil box as well as an ignition switch on his dash as shown in the photo below of his truck cab. And then the dash ignition switch would do the changing from battery to mag etc. Do I have that correct? And if so, he might want to just remove the key from the switch on the coil box. 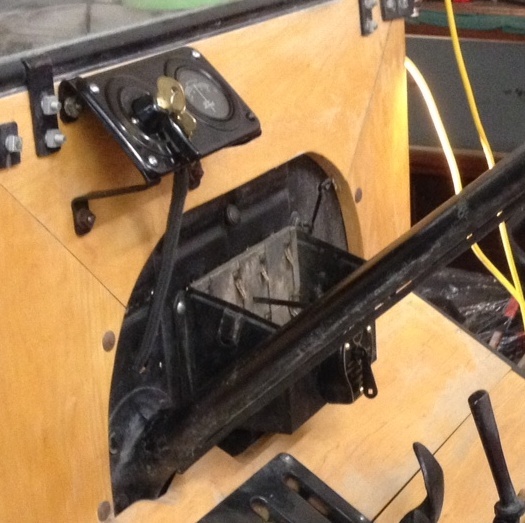 Then turn the switch on the coil box to “mag” (a fence staple works great for that – we used that for many years before we had a real key) and just leave it in that position. That way it could not accidently get bumped to the off or battery position. I have had some issues with posting more than 2 photos last night and today for some reason. I will stop here and finish in the next posting. If the above is correct the other question I have is – can a previous owner easily have messed up the coil box wiring so that the plan above would not work? And is the following a practical way to check that the wiring on the coil box is still like the factory wiring? I was thinking he could use a small flashlight battery continuity tester -- lights up or beeps etc. if you have continuity. But a multi-meter also has a continuity tester in it. To do that I believe he would disconnect the wire to the “mag” terminal on the coil box (the lowest one on the side of the engine with the water inlet and serial number). With the coils still out of the box as shown. Turn the switch on the coil box to “mag.” Then touch the second tester lead to the metal strip going across the bottom of the coil box. If wired correctly he should show continuity. Next turn the switch on the coil box to off. Do the same test and it should show “no continuity.” Next turn the switch on the coil box to battery and do the same thing and it should still show “no continuity.” Next move the test lead from the “mag” insulator on the coil box to the “battery” insulator on the coil box (the lowest porcelain on the exhaust manifold side of the engine). It should now show “continuity.” Is there anything else he should check out on the coil box while he has the tester handy? I really like Rob Wolff’s photo below as it makes it very easy to see which wire goes where so I have included it. Thanks for any help you can provide to Dan. I’m more familiar with the pre-starter cars. They are a lot less complicated and they don’t leak oil around the starter or generator. I am confused? If you don't need the switch on the coil box leave it there but disconnect it, then all connections would be handled by the later dash style switch. You still have battery and magneto connections on the back of the coil box so it would seem to me it would be a lot less headache by disconnecting or by-passing that coil box switch but maybe I am missing something. For postage I'll send him a later coil box. It will need re-wooded and paint. That would be the easiest. G.R. -- I think your idea would work also. But I think it would be more work to disconnect the switch on the coil box than it would be to just turn it to "Mag" -- if turning it to "Mag" would work. And if turning it to "Mag" will work -- turning it to "Mag" and then not leaving the key in the ignition should work for a long time. [He could also grind the ears off a key so it could be withdrawn when the switch is turned.] I haven't fiddled much with rewiring coil boxes. John Regan has an excellent waterproof kit for the coil boxes. He also kindly has placed the "how to install it" which includes the wiring information on his web site at: http://www.funprojects.com/products/5000RK.aspx click on the "Installation Instructions" near the bottom of that page. [I haven't figured out how to capture a link for that one.] Which I think it should. But I'm asking if I understand it correctly or not. I.e. would it work ok if the switch on the coil box was turned to "Mag" and the wiring was run like a regular "starter equipped car"? Jerome -- I've sent Dan the link for this posting so he can review it. I'll let him contact you concerning your kind offer. I think he is like a lot of us -- working several issues at the same time and the "honey do" or "boss do" items are probably higher than the "Model T do" items. I need to run some errands, but I'll check back later. And thank you both for your inputs. A few months ago, as I was wiring up the 1922, I had the same dilemma. I liked to use a wooden coil box I build myself a few years ago and needed a light switch to make the lights working. I disconnected the coil and magneto wire from the switch terminals and insulate them. After, I connected magneto post of the coil box to the B terminal of the junction block and the battery post to the A terminal. The light switch and the amp meter is working but you don't need the key, the coil box works with its switch and there is no danger you will have battery current on your magneto. Hap, I think your idea of leaving the coil box switch on MAG fed by the coil terminal on the dash switch is fine. Yes, a previous owner could have done things we can't even imagine, so I'd check continuity. The method you describe should work. But as this is a starter era vehicle, I'd take Jerry up on his offer of a correct coil box, install the Regan kit, and use it instead of the pre-starter box. Lose the box. It can probably be sold for a profit that will off set the costs involved in getting the correct one and repairing/painting it as needed. You're complicating something that should be very simple and might damage the Mag. to boot. There's no advantage to what you're trying to do. At the very least/cheapest I'd disable the box switch entirely and remove it if possible. Thank you for the kind words. It is always good to get a second opinion and that is why I posted this one. I did not want to steer Dan in the wrong direction. Thank you for sharing your recommendation and if Dan elects to keep the non-starter coil box on the truck long term I agree you solution would be better. I.e. it would remove one point of possible failure in the future. If I was fortunate enough to have the truck, I personally would be working to obtain the correct coil box (suggested by several of you) -- instead of having the non-starter style on the starter equipped truck. [Actually, if I had the truck right now, I would need to be coming up with a really good story of why I got another car without getting rid of one of the current cars before my wife came back home. But that is a different story.] And Jerome has made a correct style coil box available above. I agree with Steve that John Regan's kit is an excellent way to go for rebuilding the coil box. If Dan wants to start his engine before he rebuilds or otherwise obtains a non-starter coil box, I would be leaning towards a "temp fix" of putting the coil box switch on Mag [and still check to make sure that actually works correctly]. Rationale -- If the current coil box is in good working order -- it would be a help to someone who needs a non-starter coil box. If it was rewired -- it would need to be wired back correctly before the next person could use it on their non-starter set up. And if Dan keeps the earlier coil box on the car long term then taking the coil box switch out of the circuit would be a good idea as suggested by several of you. But I have not heard which way Dan wants to go yet. I'm working to move the discussions to the forum so Dan can get to know more T folks as well as hear other possible solutions. Again thank you all for your support to me and to Dan.